The go-anywhere, stackable Pancake Wheel folding wagons, folding carts, strollers and wheelbarrows outperform all other wagon or cart products on the market. The Pancake Wheel products represent new patented technology, and we show both production models and prototypes which are currently in manufacturing design development. Some of our product designs are now for sale – and others are for demonstration. If you are interested in a particular product and would like to ask questions or are a company interested in distribution or licensing, please contact us. Pancake Wheel folding Wagons are the world's thinnest. These large, sturdy folding wagons hold plenty of cargo; have easy-to-carry, patented folding wheels; fit easily in even a sedan car trunk; can carry heavy loads; and fold flat to hang on any garage or storage room wall. Designed in both plastic and metal versions, the collapsible wagons fold flat to 4” thin or 6” thin depending on the variation. For the consumer seeking a collapsible, folding, or super compact wagon, cart or other wheeled product that can stow and store in small spaces, nothing can top the world's thinnest solid base folding wagon and cart products, invented by Pancake Wheel. These products are patent protected in the U.S. and internationally (patents pending). For the current scoop on where to buy our products, go to the Buy Now tab. The exclusive patented "Pancake" ® folding cart wheel system stows and folds tires inside the profile of fold flat carts and cargo carriers. Pancake Wheel has designed both plastic and metal carts (2 and 4 wheel versions). On the green fold flat plastic cart our proprietary handle system and underside stand system hide the handle and stands when not in use—a Pancake Wheel innovation. 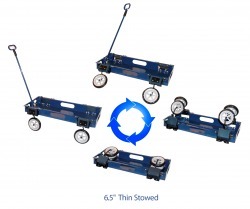 On the blue metal “road warrior” cart/wagon, sturdy metal uprights support large cargo, but are collapsible and fold flat under the folding wheels, providing for an amazing 6 inch thin folded cart profile. See how easy it is to set up and fold-up the Pancake Wheel folding carts. Demonstrated by inventor Rick Shapiro. For the current scoop on where to buy our wagon and cart products, go to the Buy Now tab. The Pancake Wheel hideaway wheelbarrow solves the age old wheelbarrow storage dilemma. Our world's most compact wheel barrow features an innovative proprietary "Pancake"® folding wheel system—one simple movement stows and sets up the wheel. The metal handles slide to recess, and the metal support stands also fold flat. This folding wheelbarrow, with either a plastic or metal tray, requires no tool assembly, hangs on any wall, and occupies the wall space of the tub only with all wheelbarrow parts folded and hidden inside. Hangs on any wall, available with a zipper storage bag. See how easy it is to set up and fold-up the Pancake Wheelbarrows. Demonstrated by inventor Rick Shapiro. Our child’s fold flat fun car ride-on designs, beat competing car designs because they save valuable space. Our kid’s ride on car is crafted to include a “hood” and “trunk” while also folding to an amazing seven inches thin. The collapsible Pancake cars store flat along a wall or in any car trunk. One design includes wheel stands which make it a great stationary toddler car, and then in the next stage the car is foot powered. Stands and tires still fold away for compact storage. Our unique Pancake folding jogging stroller design created a completely new state of the art for jogging strollers—the jogger wheels simply fold up for easy storage in any most any vehicle or for storing flat against a wall. Note: this product is not yet for sale. Also, Pancake Wheel co-developed the Nikimotion Blade baby stroller with a unique single handle that opens and folds down all stroller wheels. The long arc of this state of the art fold flat baby stroller process lasted almost 3 years, and involved design engineers at the factory, and another German designer brought in to adopt the simplest reliable mechanical internal parts. 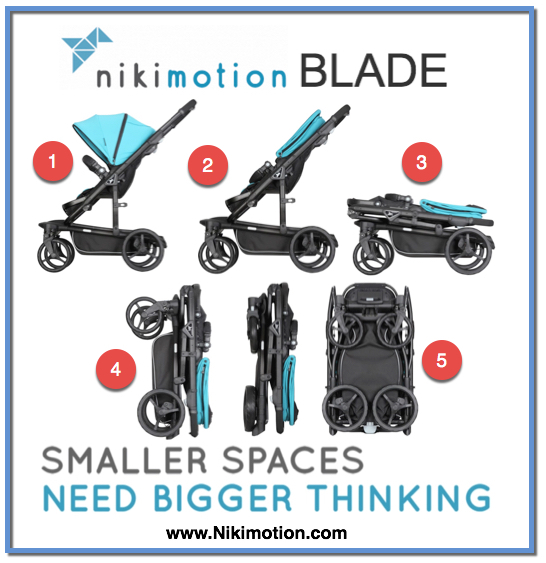 Ultimately the new design, co-invented and co‑designed by Pancake Wheel LLC, along with two other co-inventors, was introduced in Europe under a new baby stroller brand called Nikimotion, see the product setup video for details. Sales began in January 2017, nearly 3 years after we first began our “alliance” design work. European and United States patents are currently pending with regard to several of the innovations that became part of the new Nikimotion Blade baby stroller, and Nikimotion may arrive in the United States in the near future, should the product prove successful in the Europe in 2017. Pancake Wheel has been granted three United States patents which cover attributes of compact, collapsible three wheeled tricycle products. While the tricycle innovations may apply to children or adult tricycles, the most recent U.S. patent also covers a tricycle which folds into a very small, compact profile where it may be stored inside any car trunk or on the wall. It features a retractable, stowable, and removable adult push handle for a child's tricycle, and each of the rear tires simply fold inside a rear storage compartment. Also, the seat, the handlebars, and even the pedals fold flat for compact storage. Our unique Pancake 6 inch thin folding bike trailed child carrier design has created a new state of the art for bicycle trailer/carriers—the Pancake folding wheels simply fold and retain the other folding parts, and the user has a Pancake flat product to stow in a vehicle for transport, or to hang or lay flat against a wall for storage. All other available bike trailed or hand pushed carriers require that the user detach and remove the wheels, and then re-build the product with each use. Our fold flat carrier is the only kid's bike trailed carrier that folds for storage with all parts attached, and that will lay or hang against a wall. Truly a game changing product, US patents granted. Pancake Wheel: read our blog on the best, fold up, compact travel carts, wagons, joggers and more! The world’s thinnest folding solid base carts and wagons, 19 U.S. patents and counting. View all Pancake Wheel’s Youtube videos on fold flat carts, wagons, joggers here.